Even though trees are closed for the year, mom and I continue to stay busy! Check out the added pics in "vendor shows", and you'll see us in action throughout the year. 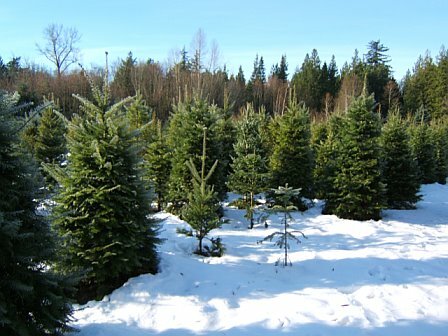 The Kelly Rd Christmas Tree Farm is a family owned and operated business. We have over 4 acres of trees and take pride in the fact we use no pesticides. We plant them and let nature do the rest! We are open weekends only from 9-4. We have a lovely gift shop with plenty of hot coffee and candy canes for the kids. We carry locally made items for you and the family. We carry Noble, Frasier, Nordman and Grand Firs, of all shapes and sizes. Over the years, we have had very special visitors. We realize everyone has their own Christmas Traditions. We hope you'll come out to visit, stay to chat, and someday, we can become a part of yours.